This bag drops like crazy, so get your guild to do Ony at least once per week, you'll eventually have full 18 slotters, and it's definitely cheaper and less stressful to simply take 30 mins to kill Ony than to farm for countless bone fragments and core of elements' for the AD reward bag. Besides, you may get some awesome epics in the process! Agreed. This bag is not that simple to obtain. One thing about 5-manning at 70 however. Onyxia is a raid boss. Sure, people have downed her now, but as you level up, so do the bosses by their very nature. They will be exactly 3 levels above the highest member in your party. The bosses scale, and currently, there are rumors that the bosses are NOT scaling correctly, and even the molten core bosses become much harder at level 70. Doable? probably, but it will be very difficult. She drops 1 per time you kill her. The same arguement could be made for Shamans and there totems or Rogues with their poison. If it had to be fair, yes then it would probably go to warlocks and hunters. Nor druids, shamans and rogues. 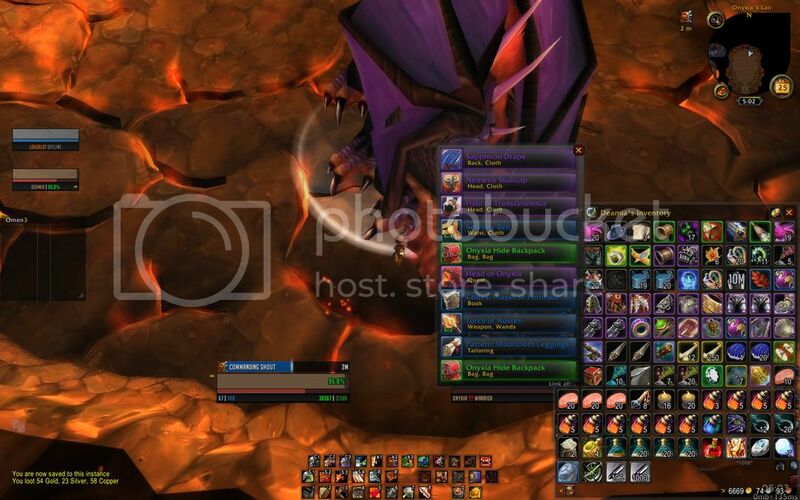 Almost every class has something u have to have in your bag, but hunters and warlkocks loose a whole bag slot. The other classes doesnt do that. But my opinion is that it is not more fair for a hunter or a warlock to get it. Its fair for rogue like it is fair for hunter. And i agree, it drops everytime, sometimes 2 or 3 drops. At some point, this bag became no longer unique, so it can be relatively easy to farm her with a handful of 70s every 5 days and get your inventory full of 18-slot bags! I understand arguing about which class gets an epic sword or polearm, but fighting over a bag is ridiculous.. Especially now, when 18 slot bags aren't uncommon at all. onyxia soloed at lvl 80 by a paladin ._. I just did my bi-weekly solo of onyxia, for the bag among other things, and was pleasantly surprised to not one but two of the 18 slot bags. So, it seems that now, she has a chance to drop at least 2 of them. I wonder if it took the spot of one of the random BoE items she would normally drop. This is a good way to get a free 18 slot bag if your level 80. You can just solo onyxia instead of wasting your money on one for around 90g on my server. "Sweet, what phat loot did you get?" Not sure why this is the case, but you cannot trade the bag with other party members after the raid, like you can with other instance loot now (> patch 3.01).